The first thing I wanted to cook after returning to the Big Apple was seafood! There is nothing like a big city on the edge of an ocean to provide easy access to some of the freshest seafood money can buy. 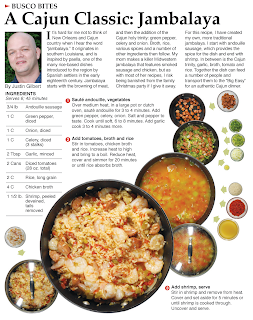 I've been wanting to make the Cajun dish jambalaya for a long time. As I mention in the introduction of the column, my mom makes a killer version that's done in what I call a Midwestern style – with smoked sausage, chicken and very little heat. I wanted to make mine a little more traditional with andouille sausage and fresh shrimp. Those are much easier to get in New York, rather than Fort Wayne - or so I thought. Cajun jambalaya starts with andouille, a spicy, smoked pork sausage that is French in origin and used heavily in Cajun cooking. I thought this would be easy to find in New York, but to my surprise I had to make a couple of stops to find it. I shouldn't have been that surprised though, it IS a Cajun thing. Not a New York thing. The fresh shrimp was easy to get. Small seafood markets dot the city. I got a pound and a half and as soon as I got home I opened the bag and held it to my nose and took a deep breath. Fresh seafood should smell and taste like the sea. And thankfully it did. It had been since March (the last time I was in New York) that I had smelled seafood so fresh. Andouille and shrimp are the two main ingredients in this recipe for jambalaya. Between them I had already spent $26, which is quite a bit of coin for one meal. All of the ingredients together pushed the total to more than $30. This is a lot, but it will feed at least 6 people or, if stored properly, will make at least 6 meals. That's around $5 bucks a person or plate. Really, that's not too bad when you break it down, and honestly the spicy sausage and the fresh whole shrimp are amazing together. I recommend trying this combo at least once if you make jambalaya. Everything else in this version of the dish are pantry-type items or stuff that can be found anywhere. For this recipe, I let the andouille stand as the spice in the dish. I would bet If I took this version to New Orleans I would be sent home and told to spice it up. Or maybe thrown into the drink by some lunatic swamp person from the History channel. But for me, the andouille provided plenty of kick; if I had added more cayenne or tabasco I would have regretted it later. The recipe also calls for the Cajun Holy Trinity: onion, celery and green pepper. I had read about this Cajun combo long ago and used it quite often. It's THE Cajun vegetable base, obviously adapted from the French mirepoix of onion, celery and carrot. Here is the major irony of this dish. 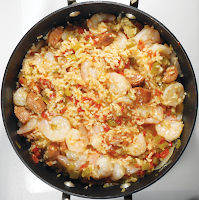 Jambalaya is adapted from the Spanish dish of paella. The vegetable base and the sausage, are French inspired. That is the beauty of the Bayou. Its Spanish, or French, or whatever – it's Cajun! A mix of a lot of different, unique stuff. This is a classic example about what is great about America, a melting pot of different taste that creates a unique flavor – or in this case a giant pot of great tasting grub! One pot dishes are my favorite. They are easy to illustrate and I can see them before they are cooked - very easy to execute and they always seem to lend themselves to an attractive presentation. It's great to be back in New York, living in the same zip code as my girlfriend and to really take the adventure I have been on for the last year of writing a cookbook to another level. I have the advantage of knowing the city as a second home. If I were new to the city, I would still be scared of all the fictitious thugs Hollywood has invented for New York and probably be wearing a bullet-proof vest when taking the subway. But I know it – I know it like my home. That's because it was for 13 years. Churubusco, Indiana will always be home. But I won't lie, New York City feels the same way. I have been waiting for summer time to create a potato salad. 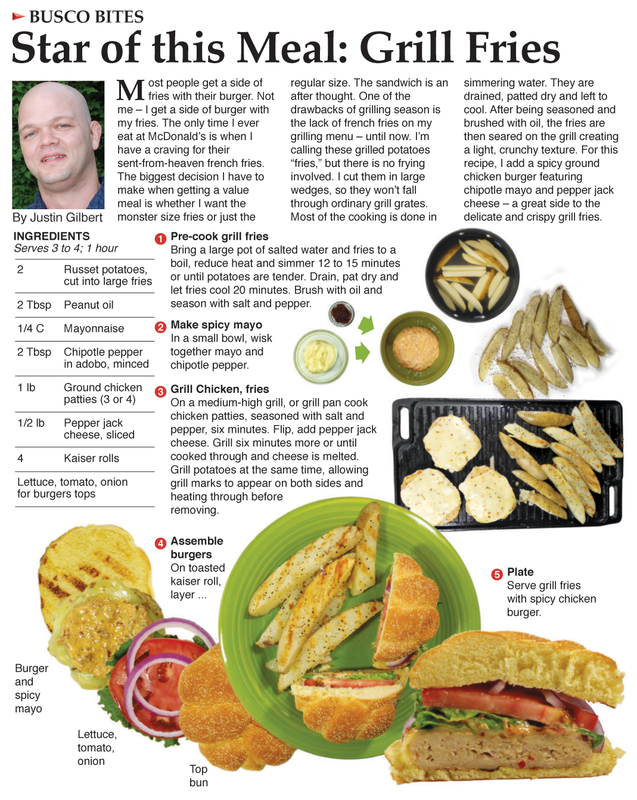 As I mention in the introduction, it's a staple of the classic American backyard barbecue. I needed one of my own. 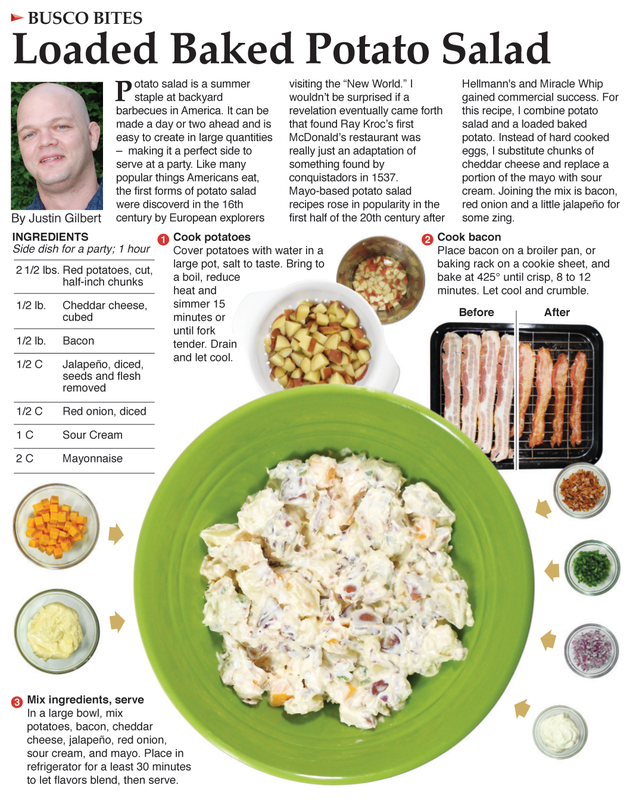 When I started my research I found that most mayo-based potato salads call for eggs, celery, onion and usually a wild card ingredient that could range from a fresh herb to diced chicken or ham. 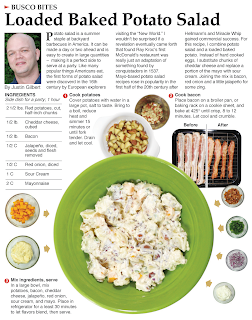 For my recipe, I took the elements of a loaded baked potato and substitute them for the basic potato salad ingredients. I swapped the egg for cheese, celery for jalapeno and part of the mayo with sour cream. The bacon was my wild card ingredient and I retain the onion. One of the keys to this recipe is that I used cubed chunks of cheddar cheese. When it's being eaten, you get large bites of potatoes AND the cheddar. Throw in the hint of bacon and ... Oh Man, please try this, you won't regret it. Potatoes (and with them early forms of potato salad) where discovered by conquistidors in Central America in the 16th century, brought to Europe and then spread throughout the modern world. So many staple foods were found in the "New World" that I'm beginning to think that Medieval European cuisine must have consisted of grass and animals they could kill. I've researched a number of ingredients I eat on a regular basis and I'm amazed at how many can be traced to the Incas and Aztecs. Potatoes and tomatoes are two. I make a joke about this in the introduction, mentioning that McDonald's is just a derivative of something found by explorers in 1537. That year is actually the date attributed to the discovery of potatoes in the New World, not just a punch line. I'm happy with the look. 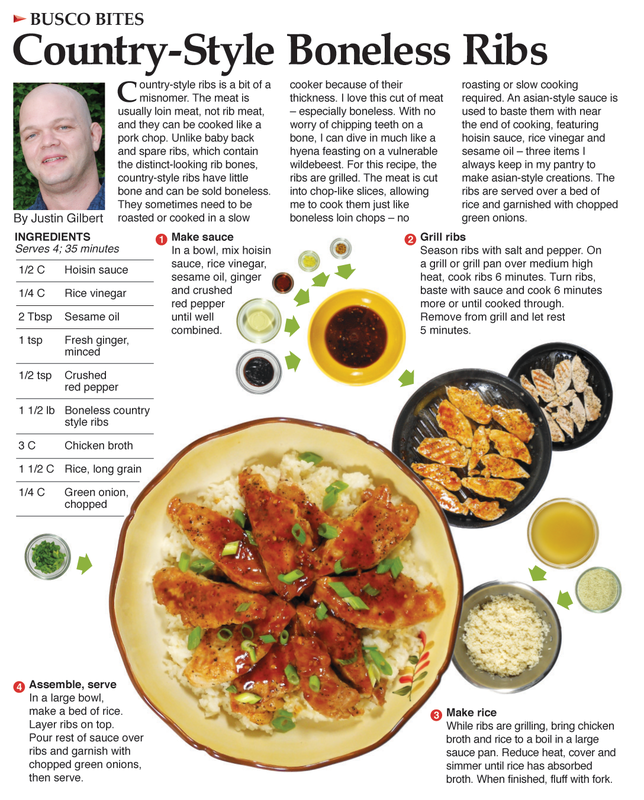 The recipe is very simple and it shows. Prep the potatoes and bacon, then mix it all together. The art for making the bacon is a first-time thing. I have never taken two shots and done a before/after mash-up for the column. I saw that technique used in Martha Stewart's Food Everyday. I'm glad to have been able to emulate it in my work. Hats off to the Designers/Art Directors at Food Everyday. This recipe is simple. 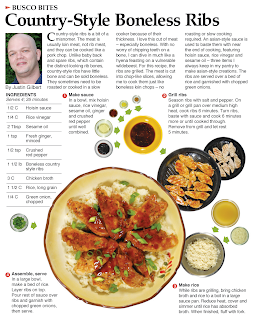 Any cook could make this – from novice to expert. 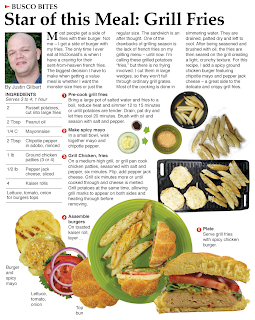 Not all of my recipes have that going for them – some are just a little more complex than others. I'm always very proud of the simple ones. There is much less to work with, meaning you have to really challenge yourself and be creative.